You never know where a book is going to take you sometimes. That was the case with Karina Sumner-Smith’s debut novel Radiant. I guessed from the jacket copy that it would be a cross between urban fantasy and dystopian science fiction. But in the end, I couldn’t pigeon-hole Radiant because, well, I couldn’t. *lol* It’s imaginative, beautifully written, and too difficult to categorize – in a good way that’s equally hard to describe. Does that make sense? Anyway, if you’re looking for a futuristic fantasy that emphasizes world-building and focuses on friendship instead of romance as the primary relationship, Radiant may just sate your appetite. 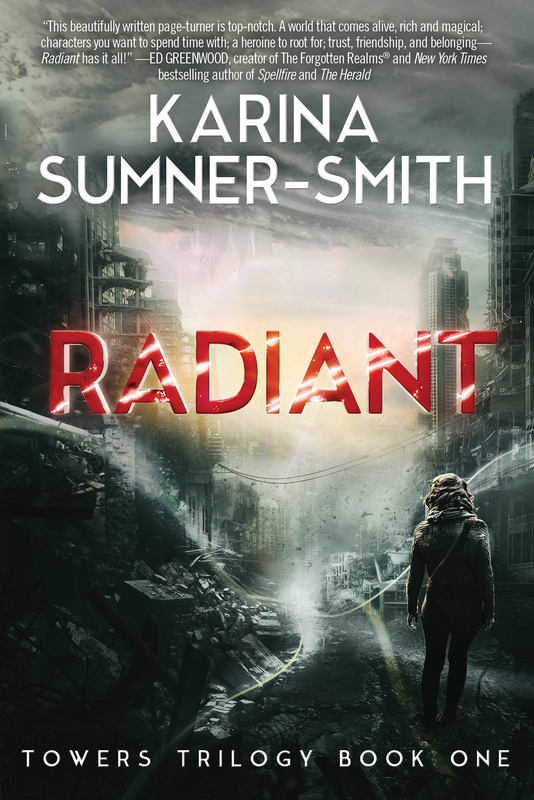 Today I’m thrilled to have Karina Sumner-Smith here to talk about Radiant as well as her path to becoming a published author. What kind of writing did Karina explore before tackling novels? What YA fantasy novels does she recommend to fans of adult fantasy? And, what can readers expect from her forthcoming sequels to Radiant? Read on to find out the answers to these questions, and much more! Congratulations on the release of Radiant! How does it feel now that the book is out there in the world? Karina: Thank you! Honestly, it feels surreal. There’s part of me that, in spite of everything, thinks I don’t yet have a real book on real bookstore shelves, a book being purchased and read by people I’ve never met. I think that part of the reason is that I’ve never actually seen my book on a bookstore shelf. I’m not really in the middle of nowhere, so much as the suburbs of nowhere, but there are no true bookstores within more than an hour’s drive of where I live. Seeing Radiant in a store is still a dream of mine. One day! Having read and reviewed Radiant, I’m sure it must be a challenge for you to describe the story. But could you tell us a little about Radiant in your own words and what you hope readers will take away from it? Karina: Oh, goodness, yes—it’s a ridiculous challenge trying to explain this book. Writing a query letter that made sense took months and dozens upon dozens of attempts. Apparently, a “far-future post-apocalyptic urban fantasy novel with ghosts and an economy that runs on magic” doesn’t sound terribly marketable. Oops. But Radiant is basically the story of a homeless girl who attempts to save the ghost of a girl who hasn’t died. One reader recently mentioned that parts of Radiant are similar to the central idea behind “The Ones Who Walk Away from Omelas,” the classic dystopian short story by Ursula K. Le Guin. I had to laugh, because yes, he’s absolutely, totally right. That story was hugely influential for me, and you can definitely see aspects of that idea in the plot of Radiant. At its heart, Radiant is a fantasy story. Yet it’s chock-full of elements from all reaches of speculative fiction: magic, ghosts, futuristic technology, night-walkers (*cringes*), floating Towers above an impoverished Lower City… What inspired you to create this incredible world? Karina: The simple answer is Xhea. In creating the City and Lower City, Xhea was my guide. I knew what she knew, could see what she saw—and used things that she said, details that she noted, to develop my own understanding of the world. For me, worldbuilding is an extension of character. From one perspective, the character is who they are because of their context—their own life, their society, their culture, the landscape around them. From another, the world is a character in itself—especially in fantasy and science fiction—and interacts with the characters throughout the story. This is also why, when people ask about events in the distant past or far future of this world, or geographical areas far outside the City itself, I can’t answer in any detail because none of the characters know either. I have no local guide to show me around; only thoughts and ideas and speculation based on the little clues in the world as it exists in the story. Another unique aspect of Radiant is its central relationship. It’s a friendship between two young women, and no ordinary friendship because one of the characters is a ghost. Why did you choose this direction? And, how important do you think it is that fantasy stories focus on other relationships besides romantic ones? Karina: I think it’s hugely important for stories to portray strong emotional ties beyond romantic or sexual relationships, especially for women. Romantic relationships are hugely important in our lives, culture, and stories—but they should never be the only powerful or transformative relationships in our fiction. However, I’ll be honest—in writing Radiant, I told the story as it wanted to be told. I wasn’t thinking of publication or marketing or target audiences (even when I should have been); I was just telling the story. It’s only in retrospect that I can see evidence of my subconscious reaction to things I was encountering in my own reading material and in the genre at large. Some fantasy fans I know are reluctant to read YA books from the genre. You read both YA and adult fantasy, and Radiant (marketed as adult fantasy) appeals to both YA and adult readers. Do you think it’s important for readers to be open-minded about stories from the genre regardless of the target audience? What are some YA fantasy books you’d recommend to adults? Karina: Oh, absolutely. I think that anyone who says that young adult novels have no value to adult readers are immediately outing themselves as individuals who haven’t read YA novels—or, perhaps worse, read one that wasn’t to their taste and decided to judge all others based on that experience. There is just so much going on in YA, so many amazing stories being told in so many subgenres, that it seems ridiculous to close one’s self off from those tales simply because of a marketing category or the age of the main character. As with all recommendations, I think different readers will like different things, and that’s okay. But a few YA novels that I simply loved the last few years include The Scorpio Races by Maggie Stiefvater, Seraphina by Rachel Hartman, Plain Kate by Erin Bow, More Than This by Patrick Ness, Silence by Michelle Sagara, Daughter of Smoke and Bone by Laini Taylor, and Grave Mercy by Robin LeFevers. Back to the world of Radiant for a moment. Let’s say you stopped in to visit the City for a day. What would you do – or avoid doing – while you were there? Karina: If I’m just going for a nice day trip, vacation-style, I’d stick to the City itself. There are so many gorgeous places to visit in the City itself, not least of which is the Central Spire. The view from the sky gardens in the Central Spire is just absolutely unreal; you could sit there for hours, just watching the Towers rise and fall. The City is breathtaking, nearly surreal in its luxury. Problem is, I know so much of what happens below the surface (literally and figuratively) of the City—and then there’s the Lower City. The Lower City is not a place that you visit; the Lower City is a place that you survive. There are so many aspects to the Lower City that Xhea doesn’t explore in detail—the gangs that run the roofs, for example—but you really don’t visit there unless you’re asking for trouble. I’d like to ask a few questions about your path to Radiant and becoming a published author. When and how did you decide to take writing seriously? Karina: I decided to be an author when I was thirteen, and was actively submitting short fiction for publication by the time I was fifteen. I actually wanted to write novels, but the recommendation at the time was for aspiring SFF writers to focus on short fiction, publish some short stories to make a name for yourself, and then move on to novels. So that’s what I did for a very long time. Thing is, short stories are very different, structurally and tonally, from novels. It’s a very different kind of storytelling; so when the time came to sit down and write a novel, I feel I had to re-learn how to write and structure a tale. I had a number of novel attempts that ended in abject failure, but I kept going, kept trying. Radiant is actually the first novel that I managed to finish. It took me a year to write, and then another three years to rewrite and revise the story into something I felt I could send out. All aspiring writers like to read success stories from published authors. Could you share with us your experience with querying agents, “the call” with your agent Sara Megibow, and getting the book deal? Karina: I have to admit, my querying process was remarkably quick and easy. I sent out a total of six queries, received four requests for full manuscripts, and signed with Sara within a few weeks. It was a crazy rush—and not at all what I’d been expecting. My submission process was a bit of a roller coaster; it was a tough decision choosing which offer to pursue—which publisher would be the right partner for this project. I’d dreamed about getting a book deal (and had nightmares about not getting a book deal); I’d imagined everything being either heartbreak or champagne and celebration. During those final few days of the process, I suddenly realized: this isn’t all exclamation points and dreams come true; it’s both a career decision and business choice. But I think I chose well: I’m really happy with what Skyhorse has done with Radiant, and with the support I’ve received. One thing I learned from our Twitter conversations is that, like me, you’re an avid tea drinker. Do you have any favorite types or brands you’d like to recommend? Karina: I’m pretty eclectic in my tea choices, though my favorites are ones that involve real tea leaves (sorry, rooibos). I love White Peony and Buddha’s Blend from David’s Tea, and the Queen’s Diamond Jubilee blend from Tealeaves. A simple Ceylon tea is always welcome. If I’m visiting a Starbucks in November / December, I’ll always go for the Joy tea. (Just don’t over-steep Joy; it quickly becomes bitter. … Hah, that sounds like a deep quote about life, doesn’t it?) I’m also currently a big fan of herbal chai spice tea; when the box from the health food store ran out, I started blending my own. How is work going on Defiant and Towers Fall, Books 2 and 3 of the Towers Trilogy? Any hints you can offer as to what readers can expect in those stories? Karina: I actually just turned in the revised manuscript for Defiant – and oh, the relief! It was a tough book for me to write, but I’m really happy with where it ended up. And, like Radiant, Defiant really surprised me. Some authors plot and plan in meticulous detail; when I do that, the story just falls flat. Writing ends up feeling like an act of discovery, and there are twists and reveals that startled me just as much as they did the characters. Especially the ending. Apparently, I just keep writing endings that take me by surprise. But, related to our conversation before, I can tell you what won’t be in Defiant or Towers Fall: romance. I know this will disappoint certain readers, but … there just isn’t enough room, emotionally, given everything else that’s happening in the story, for a romance that feels real and true. And there is just so much that’s happening in these second two books. Looking back, I feel like I spent a lot of time setting up dominoes in Radiant, and now in the second two books they’re all coming crashing down. If nothing else, it’s a ton of fun to write! Do you have any ideas for future projects after the Towers Trilogy? Karina: Oh, goodness, yes! Idea generation is actually one of my favorite pastimes, so new story ideas are never in short supply. Next up will probably be a standalone surreal contemporary fantasy—I’ve actually written half of it already, and am excited to get back to it. But I also have plans for a historically inspired fantasy series and a YA fantasy at the top of my list, and countless other half-formed stories growing in the back of my mind. Karina: Stop thinking about publishing. Publishers, self-publishing options, agents, all the rest of it – it will still be there. Focus on the work first, always. Focus on the story. Random Object We’d Find at Her Writing Desk / Space: Beads. Lots and lots of beads. About Karina-Sumner Smith: Karina Sumner-Smith is a fantasy author and freelance writer. Her debut novel, Radiant, was published by Talos/Skyhorse in September 2014, with the second and third books in the trilogy following in 2015. Prior to focusing on novel-length work, Karina published a range of fantasy, science fiction, and horror short stories, including Nebula Award nominated story “An End to All Things,” and ultra short story “When the Zombies Win,” which appeared in two Best of the Year anthologies. Purchase Radiant now at Amazon, Barnes & Noble, The Book Depository, Books A Million, IndieBound, or your favorite indie bookstore. That totally makes sense and makes it sound really good! If we see Radiant in a bookstore we’ll have to take photos. 🙂 I love the idea that the world is a character! I like that it features friendship over romance. I imagine she’s asked about romance a LOT. Sounds like she really had a great query letter, and it must’ve been hard to describe this story. I like that she says her stories just sort of happen, I can so relate. 🙂 Yay for Pern! Molly – if you manage to take a picture of Radiant in a store, I’ll love you forever. 😉 And thanks for your awesome comments! 😀 Let me know if you get it, Sara!